The Rebel Sweetheart. 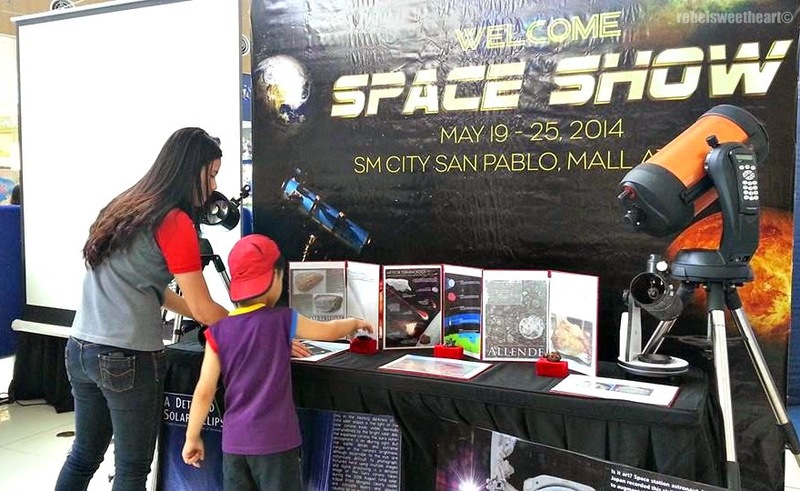 : The NCeries Space Science Roadshow. There's a space show happening right now at SM San Pablo, and the little man and I were there the other day to check it out. Yue at the Space Show! 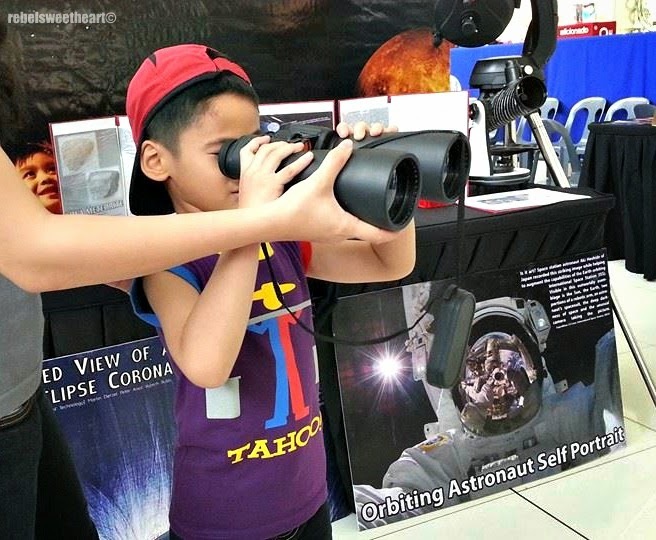 The event is actually called 'NCeries Space Science Roadshow', a mobile interactive educational event that features exhibits, interactive shows, and state-of-the-art equipment to bring space science to life. 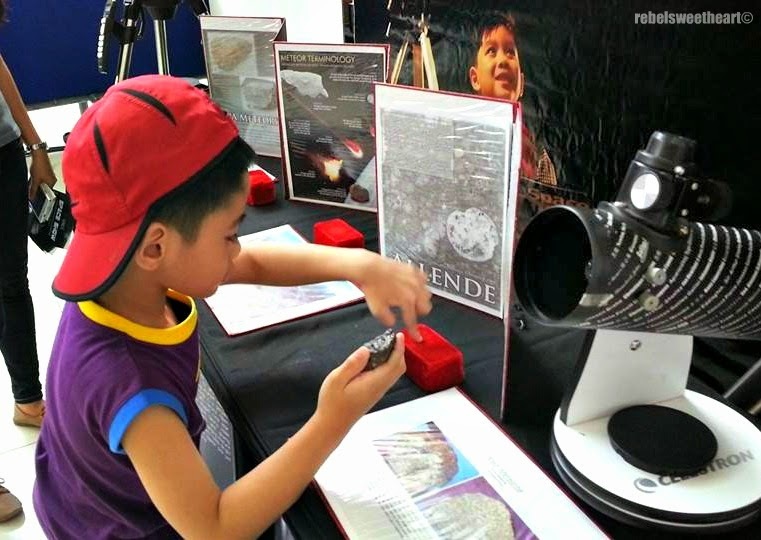 Little man learning about meteorites. 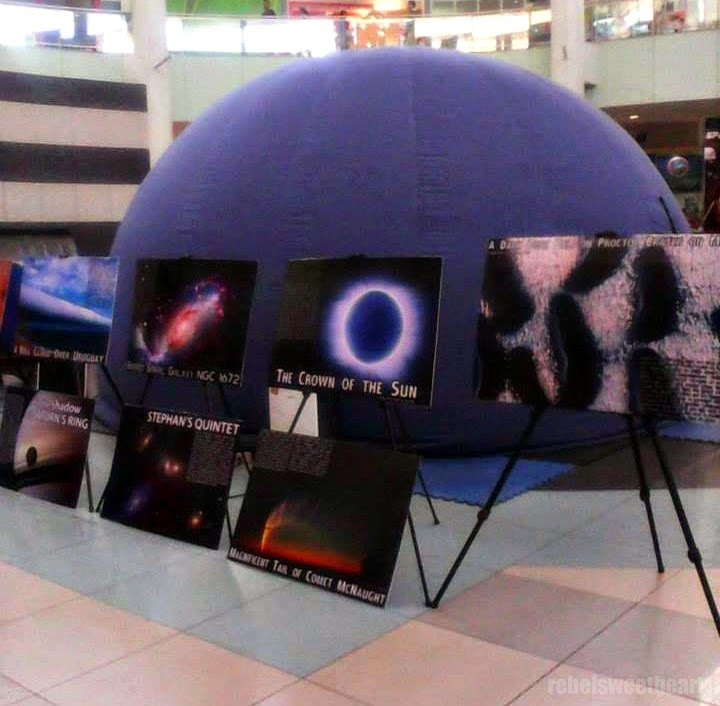 A complete resource provider for space technology and astronomy, the NCeries is founded by former Senator Nikki Coseteng, who is now an educator and president of the Diliman Preparatory School. He just can't get enough of the meteorite/rock display. 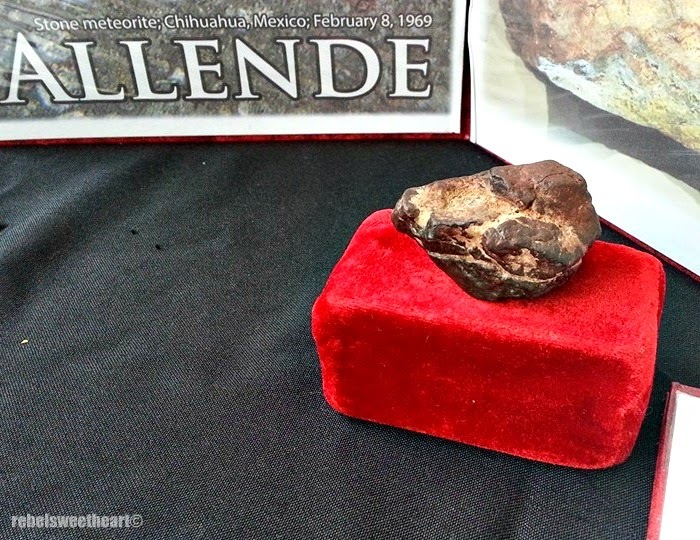 A fragment of the Allende meteorite. The space show features three major activities - the Space Science Exhibit, which showcases a rare collection of authentic meteorites, state-of-the-art equipment, and photographs that highlight the solar system and space explorations; a Film Showing, featuring documentaries on space science and astronomical breakthroughs; and the Space Dome, a digital mobile planetarium that stimulates a 360-degree display of celestial objects in a unique digital environment. The Space Dome can accommodate up to 120 people inside for its 30-minute interactive show. 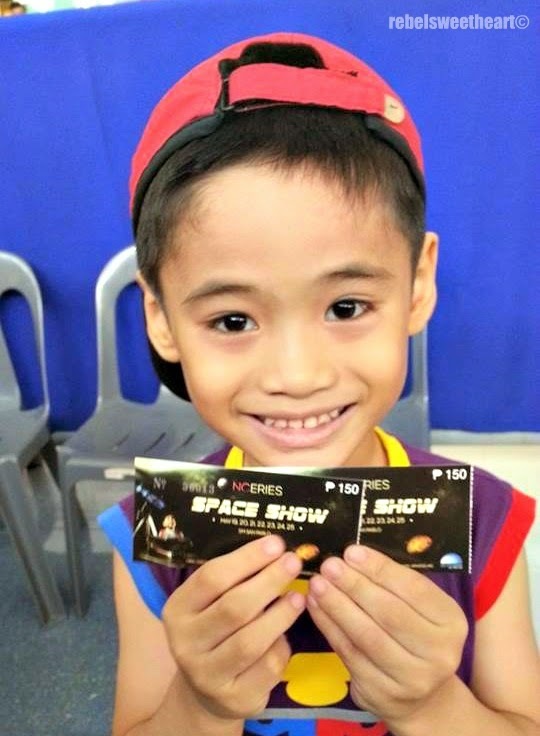 We paid Php100 each for the tickets to the Space Dome - that's Php50 off from the original price. All the other activities in the Space Show are free of charge. 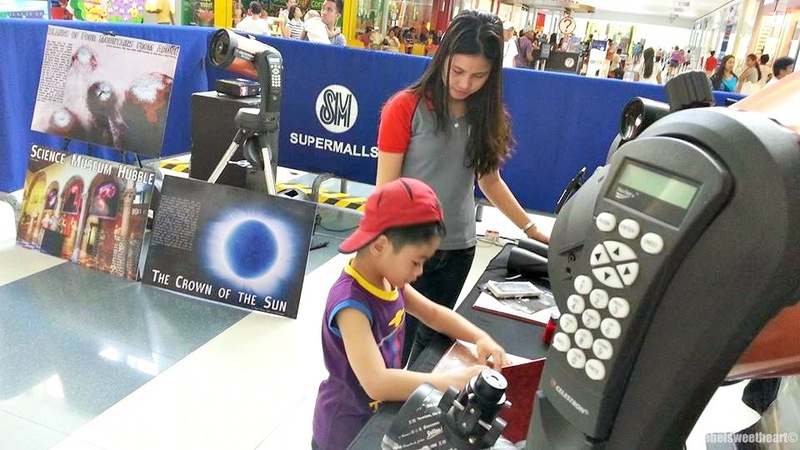 In certain occasions, the Space Show also offers solar viewing and stargazing sessions using high-powered telescopes. I reckon they do this during school visits, provided that the weather is good (i.e. no rain, clear skies). 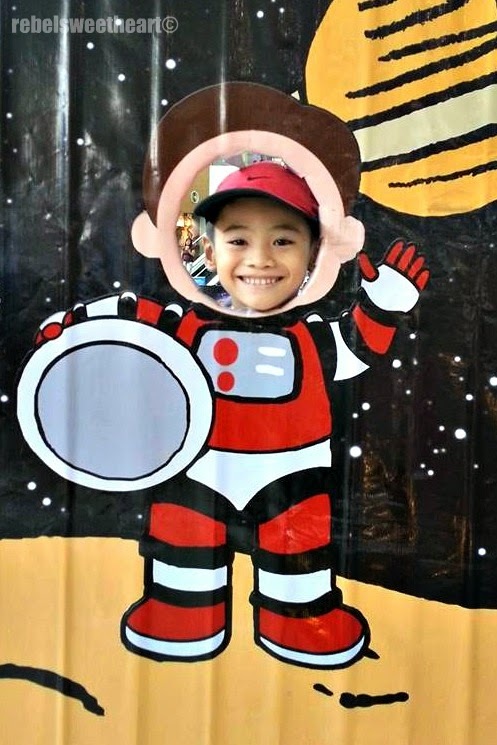 My little man, who is an aspiring aerospace engineer (that's what he wrote as his ambition in his yearbook), enjoyed the Space Show a lot - from the rocks and instruments on display, to the planetarium and the interactive show. Seeing all these made him all the more interested in rocket ships and astronauts. I won't be surprised if he asks me to take buy him a telescope one of these days. Haha! 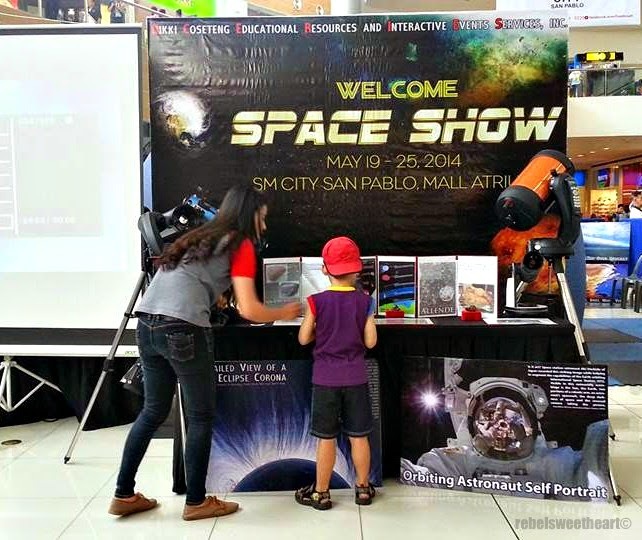 If you're in San Pablo or living nearby, do visit the Space Show with your kids! They'll be at the SM City San Pablo Atrium until this Sunday (May 25) only! 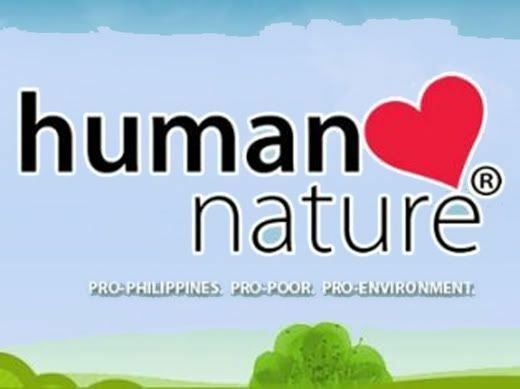 Nice naman for the space show to set up in San Pablo! I'm sure it was educational, interesting, and fun for the kids. If you make it the the U.S., be sure to visit the US Space and Rocket Center in Huntsville, Alabama! Your son would love it. There's a complete rocket ship -- full-size, INDOORS! And a piece of the moon. And lots more. I hope they come to the Fairview area! Would love to bring the kids there. Very cool, I love anything that encouraged kids (especially girls) to be involved in science. my son would love this! He is so into science! What an awesome way to get kids excited about science! My daughter would think that going to that would be super cool! This is awesome. I wish there was more things like this for kids. Thanks for sharing.